I fished a morning trip today with two young men in the first grade, Daniel and Noah, accompanied by their moms, Anne and Cheryl. I’d had the pleasure of fishing with Daniel and Anne over the summer months, and was glad he enjoyed the fishing enough to bring a buddy this go-round. Daniel (L) and Noah (R) with a few of the hybrid we caught and released today. 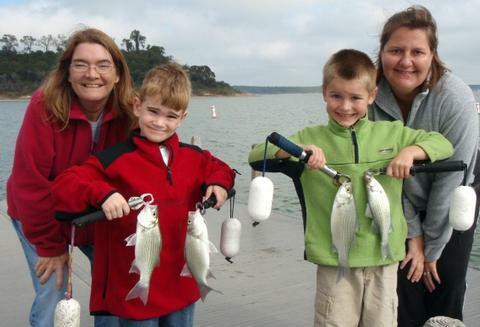 And a sampling of the white bass the boys really worked the slabs hard for today. I was honestly a bit concerned about this trip given the young age of the boys and the fact that our shallow sunfish bite is over now, not to return until spring, so, that gives me very limited options for younger kids. I like to have them do things that are both productive (to hold their attention) and not too technical (so they can do all that I ask of them and be successful at it). Then, with a S. wind forecast for the day, but a nearly ESE wind actually blowing at launch time, I thought things were going to be difficult. We did some downrigging to start things off around Area 677 just to get the boys to learn the basics of getting the line properly metered out behind the boat and to await the rising of the sun. As sunrise (obscured) I spotted some action between Area 080 and the bank in 10-21 feet of water (BA:14 HG). When we arrived on the scene, there were hybrid chasing large bait at or near the surface, but sonar showed they were well-scattered. Since the boys’ casting ability was limited, we went with a downrigging approach and, over the next 45 minutes, boated 16 fish on large Pets including 4 keeper hybrid. As the action waned, the fish moved S. into deeper water (30+ feet) and became less and less willing to bite. We moved on and checked several areas before finding fish once again in the vicinity of Area 677 (BA: 5 HG). I saw Mr. George O. here and he said some hybrid had moved in then back out and that the bite was on the decline in this area. As I ran sonar, I noted a lot of smaller, suspended fish in the area. We rigged up with twin downriggers baited with small Pets, and two flatline trolling rods rigged with Ripshad 200’s and proceeded to steadily catch fish from the top 14 feet of the water column for about 45 minutes. We boated a total of 8 fish here. This was going well, until, as happens with 1st graders, the novelty wore off. Daniel was the first to pipe up and say he’d like to do something new. 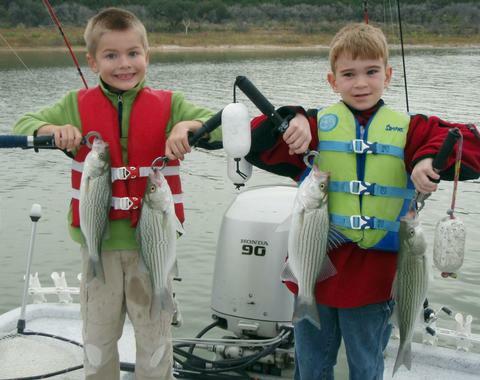 So, we left fish biting, hoping to go find other fish near bottom and, hopefully, talk these boys through the process of working a slab for white bass. We got to the vicinity of Area 686 and found fish in 27-28 feet here. I could get them to follow my bait, but I was doing a lot of “fancy footwork” to make it happen. In the end, I used my slab to keep fish teased up off the bottom, while Daniel and Noah attempted a “smoking” retrieve. As they got the hang of things, they were working their baits effectively on about 1 in 5 attempts, and caught fish about 1 out of every 3 or 4 times they got it right. In the end, the boys added 9 fish to our tally from this location when, at around 10:30 both they and the fish appeared to have had enough. I looked at the moms and they knowingly nodded that this would be a good time to call it a day. We headed on back to the dock and had some fun posing for pictures using the Boga Grips and then let all of our photo subjects return to the water. The boys, both scouts, and both sons of soldiers, were in a particularly patriotic mood today, it being Veterans’ Day and all. I’ll not soon forget the habit the boys made of singing The Star Spangled Banner at the top of their lungs as we moved from place to place to occupy their time when they couldn’t have lines in the water. I half-jokingly told Cheryl and Anne that the sound resembled something between a boys’ choir and a number by the Chipmonks. We finished up the trip with 33 fish boated by the boys. Afterwards, given that I have a number of forthcoming trips on the books, I laid over for about 90 more minutes and did some scouting in areas we didn’t have an opportunity to fish at today. Over those 90 minutes, I boated an additional 30 fish split equally between Area 686 (out a bit deeper than we’d fished earlier) and Area 688. At Area 688, I started off directly on this waypoint, but saw fish begin to feed as the skies began to clear and brighten over the deeper water to the NE of here. I eventually wound up casting to fish feeding near-surface over 54 feet of water in this same general vicinity. I boated these near-surface fish on swimbaits. Wind: Winds were SE at 6-7. Skies: Skies were leaden grey with low cloud cover until ~11:15 when some sun began to break through.